Your clients will have a great time! Rust’s Flying Service would like to extend a warm welcome to you! Your clients will be satisfied with the best and largest flight seeing air taxi transport company in Alaska. We have been in business more than 50 years; the Rust family stands behind the service and safety record. We meet the insurance requirements of the largest tour operators in Alaska. We offer versatile seating in different configurations to accommodate different sizes of groups, as well as experienced pilots, excellent airplane maintenance and a commitment to flying when our clients can have a good experience. When the weather does not allow us to do the tour your clients scheduled, we will offer them the option of taking an alternate flight or provide a complete refund. We operate a large, well-maintained fleet of planes. All our seats have window views; all seats have headsets and microphones in which your clients can not only listen to the pilot narration and point out the animals and landscape features but can ask questions and listen to music. 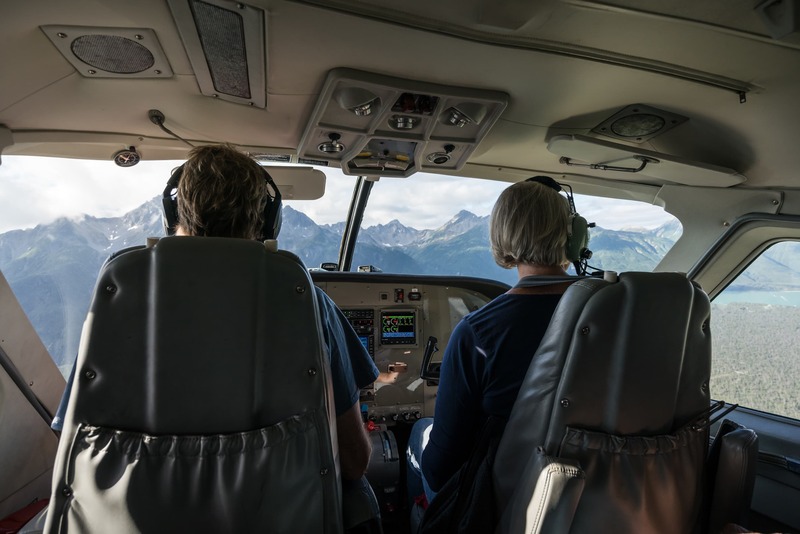 The large fleet size means that you can book a group with us and we can move them to their destination promptly, whether it is to a wilderness lodge, or for flightseeing, fishing or bear viewing. “Rust’s and K2 pay commissions promptly and are very easy to book.” — Cole, Concierge Desk, Millennium Hotel, Anchorage, Alaska. That says it all; we take good care of our travel industry partners. When you call our office, you should be prepared with the information on what your clients want to do; if it is a custom destination or event, we are happy to work with you on scheduling. We will need to know accurate weights of your clients for plane scheduling and balancing. If someone does not want to transmit an individual weight, you may group passengers for their weight. It is also helpful to know what hotel your guests are staying in order to contact them with transportation information and weather delays. To support you in sales, we have a number of resources available: brochures, information sheets for reference books, information on our planes and rights-free photos. If you are planning an “Alaska party” or travel night, we can supply you with prizes. Additionally, we love to show off our product and offer travel professionals special pricing for tours.